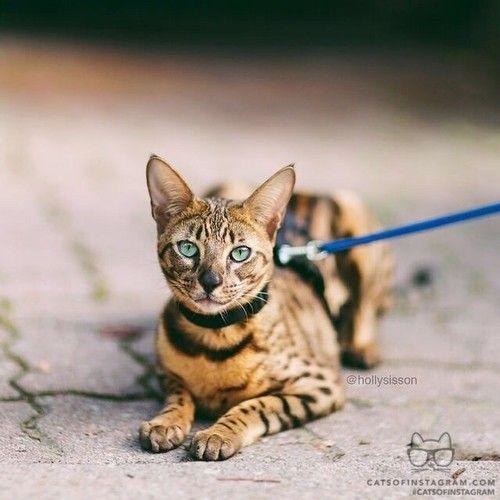 The Savannah cat has become a popular pet, because of its interesting and exotic appearance as well as its very characteristic tameness and fondness of their owners. The combination of serval cats and siamese makes this type of cat one of a kind. Savannahs makes great family members and are very social and interesting animals. Savannahs are a mix of wild serval cats and domestic felines. Savannahs are cousins to the lynx and ocelot, and they all wear the same beautiful spotted coat. 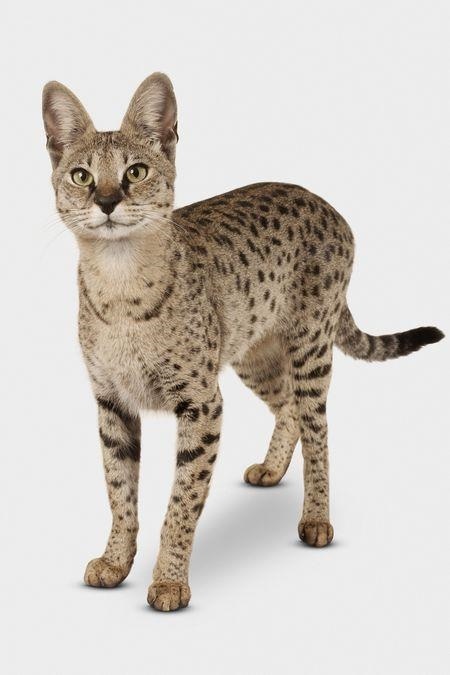 This beautiful breed was created by cross-breeding a domestic cat with an African wild cat. The first litter was born in 1986, with only one kitten. The kitten was named Savannah, which also became the breeds name after breeders found out about the new kitten and took a large interest in this new, beautiful breed of cat. 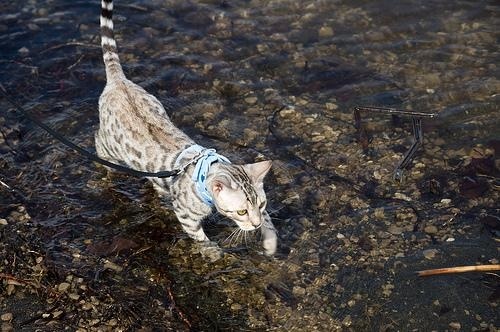 Most cats are not too fond of water. It is even safe to say that the majority of cats hate water. But if you need to give your Savannah cat a bath, it won’t be a difficult task. 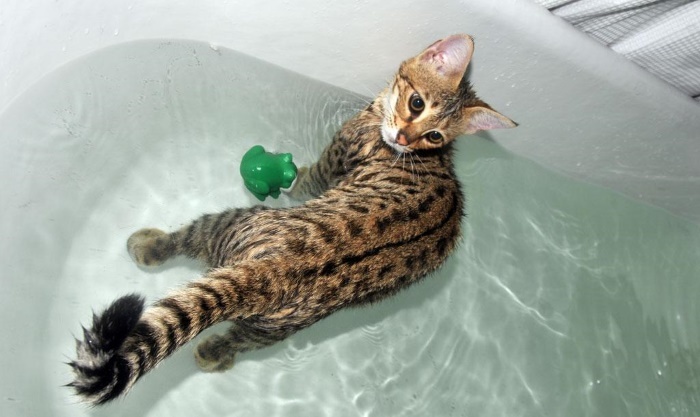 The Savannah cats are known for their love of water, and it is not unusual to find them swimming around, splashing and having the time of their life, while most cats would be longing for bath time to end. 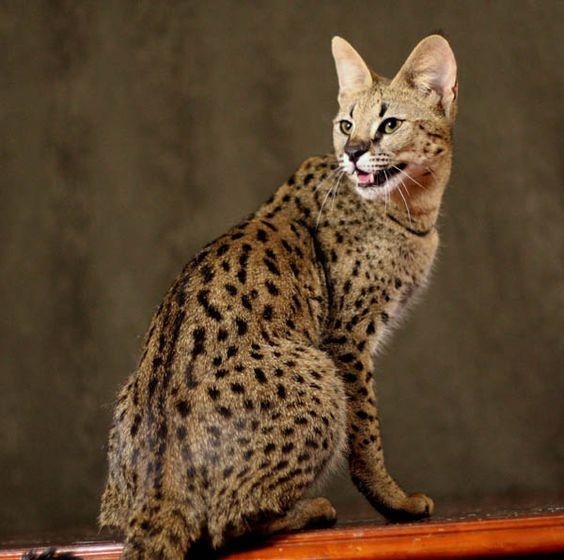 The Savannah cat is an active, adventurous and curious cat and their its personality has been compared to dogs. The Savannah quickly creates strong bonds to with their owners and often follow them around just like a dog. This has made the Savannah an excellent and popular pet for both cat and dog lovers. 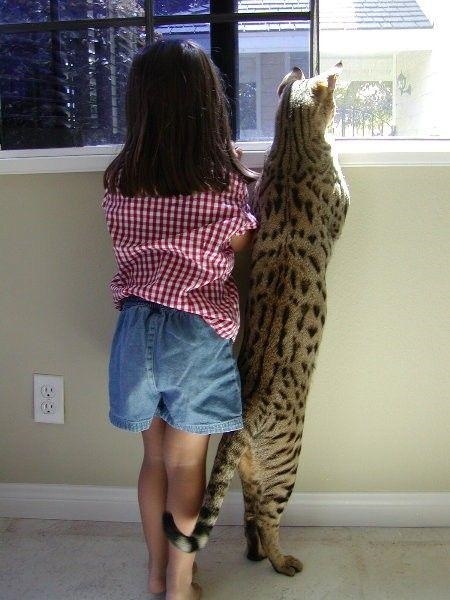 Savannah cats are generally intelligent and curious. They are easily taught tricks on by command, that just like you normally would see with a well-trained dog doing, . This includes tricks such as retrieving objects, opening doors and cabinets, turning the faucet etc. They also enjoy walking on with a leash, which many other cats find difficult-unbearable. 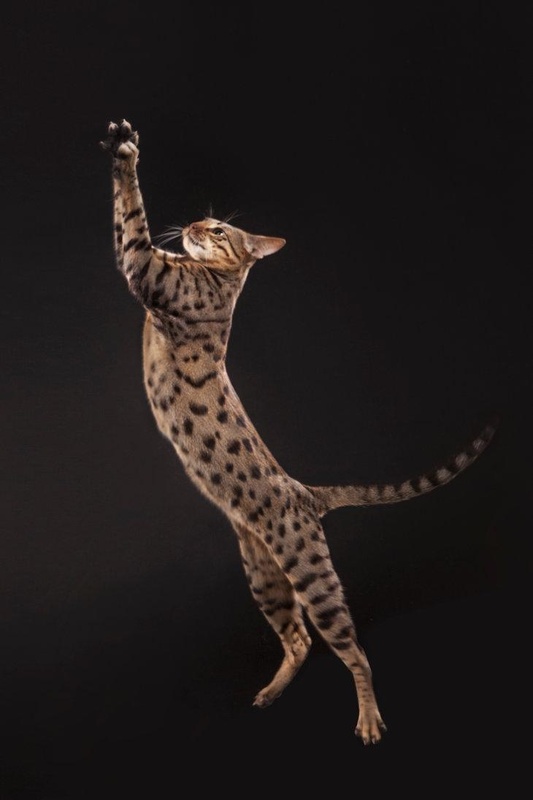 Just like dogs, Savannah cats can also be clicker-trained. The Savannah cat is, as mentioned earlier, an active and adventure adventurous cat. This, paired together with their long, slim legs make them excellent climbers and jumpers. Many cat owners claims that their Savannahs likes to be up high, finding them on kitchen counters, on top of refrigerators or cabinets. The Savannah can also jump 8 to 11 feet horizontally, so this curious cat can change its location from one place to another before you have the time to blink. If you are interested in buying a Savannah cat from a breeder, prepare for a high costto put down some money. This beautiful companion comes at a high price. Savannahs are ranged from F1 down to F6, meaning First Generation or Sixth Generation so on. 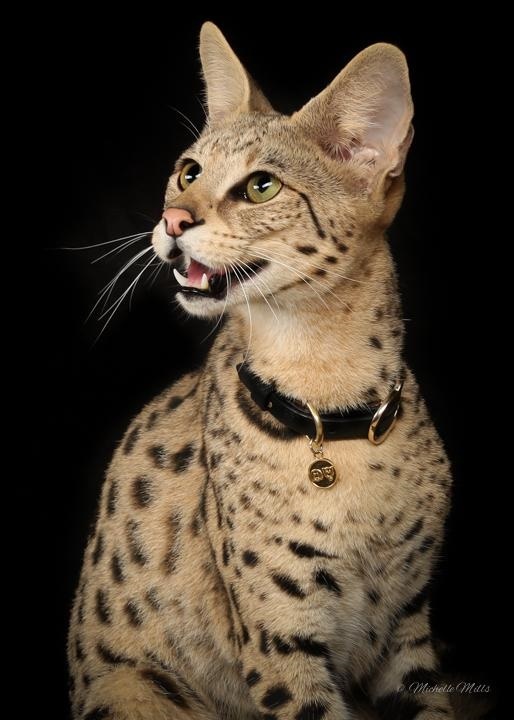 A Savannah cat is considered purebred at F4 and later generations. The price of a F1 Savannah cat is somewhere between $17,000- $22,000, because of the extreme difficulty of pairing and very small litters. Lower generations such as F3 to F6 will cost about $1,000 – $ 4,000, since the pairings are easier and each pairing yields bigger litters. There have been two cats to hold the Guinness World Records title for Tallest Domestic Cat, both of them being Savannahs. The first winner in 2013, name Trouble, was 19 inches tall, toes to shoulder. Trouble fell to second place in 2017, when the Savannah Arcturus was measured at just over 19 inches tall. Savannah cats loves playing with their human friends and are known for even greeting their family members at the door. The Savannah fluffs the base of their tail when greeting and can also wag their tails just like a dog greeting its human would. It is usual for Savannah cats to sleep close to their humans at night, sometime even under the covers for warmth. They also enjoy playing fetch, since they are easily taught how to retrieve objects. They are not afraid or cautious of strangers, and they will happily engage in playtime with anyone who is willing to play. Golden with black spots is the most classic look for the Savannah, but their pelt fur coat can be come in many different shades and colors. 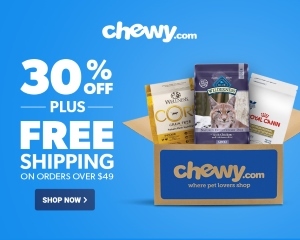 Black, brown, silver and smoked are the colors that are accepted by TICA (The International Cat Association), but they can also be marbled, pointed, blue, cinnamon, chocolate, lilac and other dilute versions of colors. They make great pets whatever regardless of the color of their fur, but the colors that are not accepted by TICA can’t be shown in cat shows. The Savannah cat is, as earlier mentioned, very loving and fun to live with. They are playful and curious, and always up for a snuggle or game of fetch. However, they also have a big hunting instinct and are filled with excess energy. If the cat doesn’t get plenty of exercise and stimulation, it will get restless and destructive. This might cause them to start playing rough games with your furniture and other household objects. A Savannah will feel the best with plenty of exercise,s from fun games and toys, and daily walks in with a leash. And make sure to protect valuable objects, since you can never predict what a Savannah will be up to next! You need a bit of humor to keep a Savannah cat. The Savannahs seems to be pranksters, and it’s common for the cat to climb up high and push things down on you, or maybe drop things in your food or wake you up in the middle of the night – just for what seems to be the laugh of it! The Savannah demands lots of attention and it knows how to get it. 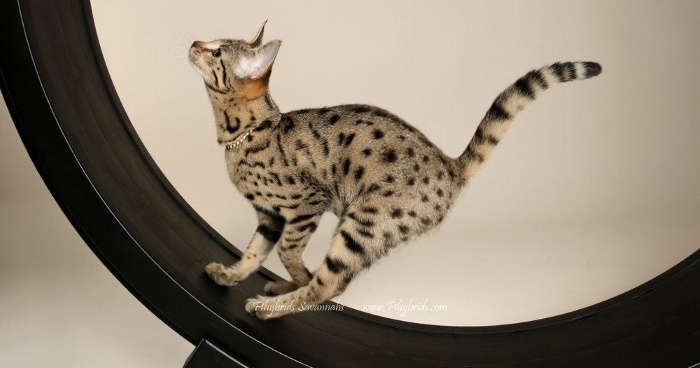 You won’t have a dull day with a Savannah cat in your home!